16th August . 11am to 3pm . Wilton's Wicked Wednesdays are an opportunity for the community to engage with free arts and crafts sessions whilst learning about Wilton's history. Welcome to all and fun for all the family. 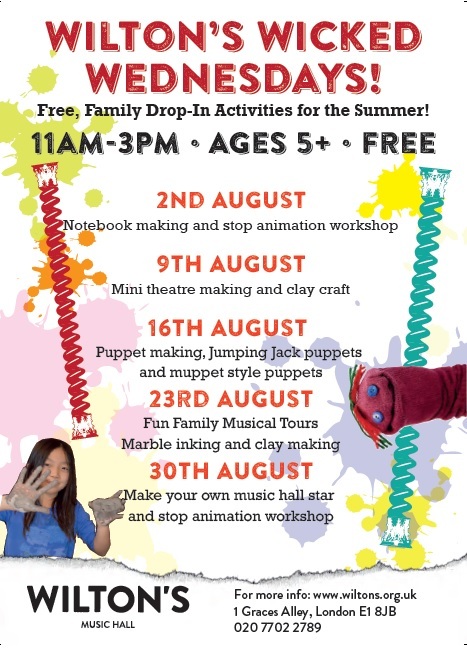 Take part in this exciting puppet based arts and crafts workshop. Create your own jumping jack puppets, Muppet style puppets and shadow puppets!. With the help of technology and using stop animation, see your character come to life as a GIF! Share your GIFs on twitter with the hashtag #wiltonswickedwednesdays on @WiltonMusicHall - we would love to see what you make! Click here to download the flyer for the whole series.